The daughter of a saxophone player in a U.S. military band, Michelle Johnson was born in the western sector of Berlin where her father was stationed at the time. Three years later her family was re-located to Washington D.C., and it was here that during her teen years she became involved in the local go-go club scene, adopting the name NdegéOcello (Swahili for "free like a bird") and playing bass in bands such as Little Bennie and the Masters and Rare Essence. After moving her center of operations to New York City, a period of musical study took place in the mid-1980s -- initially at the Duke Ellington School of the Arts, but frustration with the outdated attitudes of the faculty later instigated a move to Howard University. The arrival of her son brought her formal education to an end by 1988, and Me'Shell returned to New York to earn a living and continue her music career. Work in the early 1990s with Women In Love, The Black Rock Coalition, and as a solo performer steadily built up an interest in NdegéOcello's music, leading to offers from Prince's Paisley Park label, Warner Brothers, and the Madonna-founded Warner Brothers subsidiary Maverick. Choosing what seemed to be the lesser of the three evils, a deal was struck with Maverick in 1993, resulting in the debut release Plantation Lullabies later in the year. 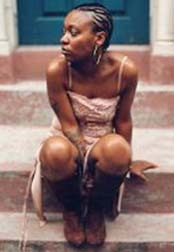 The process of creating the album was far from pleasant for NdegéOcello, but the album received a warm critical reception, earning three Grammy nominations and featuring a popular single in the form of If That's Your Boyfriend (He Wasn't Last Night). The mixed blessing of chart success was further confronted through her duet the following year with John Cougar Mellencamp on his cover of the Van Morrison tune Wild Night: accompanying the increased name recognition brought about by the song came the inevitable media pigeonholing, and NdegéOcello took her time formulating her next album Peace Beyond Passion (1996) in defiance of these expectations. Filling in the gap between releases was another collaborative project, this time with Chaka Khan on the song Never Miss The Water. A mainstream breakthrough remained elusive for the singer -- apparently by design, as the undisguised explorations of sexuality and corporate radio-unfriendly content on potential "hit singles" such as Deuteronomy: Niggerman were clearly not designed for easy mass consumption. Another long gap preceeded the completion of her third album, Bitter (1999), which introduced string arrangements into the restrained R&B of her compositions. Subsequent releases continued the process of sonic exploration, Cookie: The Anthropological Mixtape (2002) focusing more on funk and hip-hop, and Comfort Woman (2003) submerging into languid psychedelia. In the long periods between most of her own releases, NdegéOcello remained active as a bassist for other musicians, contributing to recordings and performances by Prince, The Rolling Stones, Arrested Development, Herbie Hancock and Alanis Morissette, amongst numerous others. Forays into scoring for dance productions have also been undertaken, as well as soundtracks for the films Disappearing Acts and A Time for Dancing.